For the past ten years since we bought our mountain ”cortio” in Spain’s Sierra NevadaMountains and Alpujarra, we have enjoyed exploring the hills and mountains just south of Granada. Since 2004 we have been organising walking holidays here as Mountain House Holidays though we also operate a guiding service as Sierra Nevada Guides and are the only qualified British International Mountain Leaders operating in the Alpujarra and Sierra Nevada Mountains. The Sierra Nevada boasts mainland Spain’s highest mountain, Mulhacen at 3482m. The southern slopes of the Sierra Nevada are known as the Alpujarra an area great for hill walking, especially in the winter months when the high mountains are covered in snow. Walking is possible in the Alpujarra all year round though from mid June until the end of August it is too hot for most people. However when the sun is out even in mid winter we have been stripped down to T shirts. This part of Spain was ruled for centuries by Muslim kings and was colonised by Berbers from the Atlas mountains of Morocco. The architecture of the villages is identical to those of the Atlas mountains. However the tradition here is to paint the houses white and the villages look stunning adorning the hillsides, prettiest of all being Pampaneira, Bubion and Capileira. The Sierra Nevada has been described as like Cairngorm with altitude! Unless you enjoy winter mountaineering or snowshoeing, the high mountains of the Sierra Nevada are best avoided in the winter months and spring. The high mountains start to become accessible again from mid June and remain so most years into November. Gentians and "The Star of The Snows"
The area is a national park and is famous for it’s wildlife. There are many endemic species in addition to those shared with other areas. This is because of the huge variation in altitude with climatic zones from Mediterranean to Alpine. Here it is almost certain that if you know where to go you will see eagles and vultures circling above you. The walking can be varied too, encountering terraces of almond blossom, chestnut woodland and oak forests. There is even an extensive forest of Scots Pine! In the high mountains as the snow retreats in summer the ground becomes carpeted with Gentians and a local version of the Edelweiss known as the Star of the Snows. The pretty white villages all have water fountains to replenish drinking bottles and there are many wayside “fuente” too, some famous for their mineral waters and even fizzy. 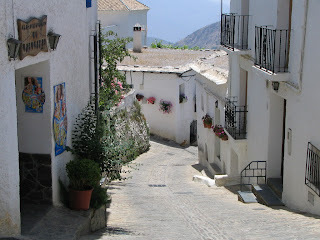 February, March, April and May are nice times to visit the Alpujarra as the land is green with new plant growth. Easter in this area brings traditional processions of statues from the local churches through the narrow streets thronged with crowds. 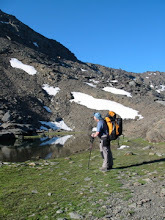 Summer though hot in the valley, is a great time to walk the higher peaks of The Sierra Nevada. Sun is almost guaranteed in the summer and we have never had to wear a waterproof jacket though occasionally a windproof. Up high the temperature will be between 15 and 20 degrees during the summer though can drop considerably in high winds. Autumn is a good time for both the Alpujarra and Sierra Nevada. The tourists disappear, everywhere becomes quieter though the warm weather stays. The weather does become changeable but not to the extent that it rules out walking. Footpaths are not well marked though the maps available are adequate and there are several guidebooks detailing the walking that can be bought in the U.K.
Our walking holidays take advantage of our local knowledge of the best walks ensuring that no day is wasted. For those organising their own holidays, there are a selection of our favourite walks available to download from our Sierra Nevada Guides website. There is detailed information about the area on our website and we are always happy to advise and share our knowledge. A few years ago Mountain House Holidays were contacted by national charity who provide services for people with learning disabilities. They had been turned down by several companies who organise charity challenge events because they wanted to include people they support in a fund raising event. As we organise and run adventure holidays for people with learning disabilities we readily agreed to work with them and help organise their challenge! iv. An Ascent of mainland Spain’s highest mountain, Mulhacen 3482m over two days. Spain, two of the nights were in a mountain hut, The Poqueira Refuge. Since then, we have hosted a number of holidays for people with a learning disability, but thought it would be good for 2013 to return to the concept of an inclusive challenge. Why not join us with a group of friends (including people with a learning disability) and raise some money for charity. There is a short film clip on our website showing the sorts of activities we provide for people with learning disabilities and the inclusive approach we take. Mountain House Holidays are pleased, once again, to support the Peak District Walking Festival 2013. We have a full programme of moorland walks and navigation courses, all led by fully qualified leaders. Get ahead of the game and book your dates for the Peak District Walking Festival 2013. Prices for the guided walks are normally (unless otherwise stated), £10 adults, £5 children and £30 for families. 8.5 miles of tough walking. 10am till 4pm. Crossing the centre of Kinder and visiting 5 aircraft wreck sites, Kinder Gates and Kinder Downfall. The best that Kinder Scout has to offer! 12 miles, 10 till 4.30. Visiting the extensive remains of Superfortress 44-61999 and B24 Liberator. Also 2 F-86 Sabres returning along Ashop Clough. Rockall Cottage and Bacon Butties! A circuit from Gradbach taking in Lud’s Church and Roaches End, with lunch at Rockall Cottage. The price includes the Bacon Butties, hot drinks and cake. 8 miles of fairly rough walking visiting rock formations, wells, aircraft wrecks and shooting cabins. Stunning views! This will include ascents of both Crowden Brook and Red Brook which are classic scrambles and a chance to visit the sites of 3 aircraft wrecks. There is a short film show of these scrambles on our website. Map and Compass, tools for navigation! Mountain House Holidays will be running guided hut to hut walking holidays in Slovenia’s Julian Alps in 2013. Here is an account of our two visits to research the trip. Driving from Ljubljana Airport towards Bohinj, which was to be our base, I remember commenting on how green the countryside was and how clean this country appeared. That was on our first trip in May. We were fortunate to return for a longer stay in August and I got the same impression. Slovenia is a beautiful mountainous country. Slovene’s are very proud of their mountains, Triglav the country’s highest mountain (2864m) even appears on the national flag and every Slovene is expected to climb Triglav at least once during their life! 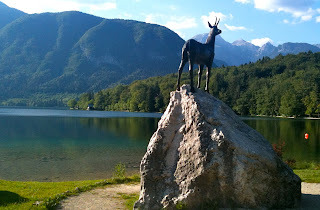 The base for our first trip was Stara Fuzina near the shore of Lake Bohinj. It was from here in 1778 that three local men set out and made the first ascent of Triglav. In May when we made our first visit there was still too much snow to walk the high peaks safely but the high pastures were clear and full of the most spectacular spring flowers. Indeed there was a flower festival happening attracting many visitors on guided walks into the alpine meadows. This would be a great time to visit, before it got too hot for some late spring warmth. The only down side of visiting in May was that many of the huts were not yet open, during the season they provide a good service in food and drinks. The paths are very well marked with red and white markers and all major junctions are marked with signposts giving place names and the time it will take to get there. When we visited again in August, it was very much hotter with valley temperatures up to 30 degrees during the day. On this trip though we planned to spend most of the time up in the high mountains which was much cooler like a British summer! At night and early in the morning it did get cold requiring jackets, hats and gloves. We toured around the Triglav area staying in some of the numerous huts that provide clean though basic hostel accommodation. The paths we walked were limestone with amazing Karst features. Often with steep rocky steps, sometimes with wires and metal steps to help. Ibex were common and although this was late summer there were still many stunning plants including Edelweiss and the rare Zois Bellflower (a plant where bees have to drill into the flower to get at the nectar). Historically the area is fascinating too. A country that has been ruled by other nations from Roman times until recent independence with the dismantling of Yugoslavia. There are three aspects of their history that I found particularly interesting: the sites of fortifications and other remnants of the 1st world war high in the mountains; examples of forms of cooperative farming dating to the early 1800’s which when the communists took power in the 1940’s were held up as models of good practice allowing these alpine cooperatives to continue; and the history of Slovene mountaineering which is remarkable. There are museums to visit that highlight all three of these subjects. The walking in this area is as good as any in the central alps and Slovene culture is geared up to support walkers with a great network of signed paths and alpine huts. The most difficult aspect is how to get there as flights are limited and the only low cost airline flying there from the U.K. is Easyjet flying from Stanstead. Once in Slovenia, public transport is good though if you are planning a hut to hut tour consider getting a taxi to and from your start and finish points. Mountain House Holidays will be running Hut to Hut walking tours of the Triglav area in September 2013. These 7 night full board, fully guided holidays will cost £850. The price includes all transport, accommodation and food and the services of a fully qualified International Mountain Leader. Mike and Jane from Mountain House Holidays are fully qualified International Mountain Leaders. If you or you group would like a Walking Holiday in Slovenia organised at other dates, please contact us to discuss your ideas.